Belly Bag Collection Device: This Revolutionary Latex-Free Urinary Collection Bag Alleviates Many Of The Inconveniences, Problems And Possible Hazards Of Conventional Drainage Systems. 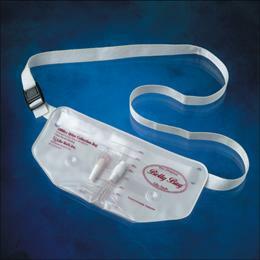 The Belly Bag Is Designed For Men Or Women Who Have An Indwelling Foley Or Suprapubic Catheter. The 1,000 Cc Capacity Bag Fastens Comfortably Around The Waist And Can Be Easily Worn 24 Hours A Day. Its Anti-Reflux Valve Behind The Catheter Port Prevents Reflux Urine Flow. The Drain Valve Is Placed At The Normal Urethral Position For Easy, More Conventional Emptying.